Conventional techniques for attaching deer to a hook include spinning or stacking the hair to form a head or body. Another less known technique is called blending. By blending deer hair, you can produce bugs with mottled or speckled color schemes. Here are two simple techniques that help you create clipped deer hair bugs that sport a mottled, salt-and-pepper look. I first published this material in an article titled "Blended Deer Hair" in Fly Tyer Magazine in the Autum 1999 issue. If you're not familiar with the magazine, you should be. It should be standard reading for every fly tier and you should subscribe to it. Learn more about Fly Tyer magazine at flyfishingmagazines.com. Most fly tiers who enjoy tying deer-hair bugs are familiar with the two common methods of attaching hair to a hook. Spinning, the most common method, produces a head or body of solid, uniform color. Alternate between two colors as you spin hair on a hook, and you make a body with bands of color. Stacking, the second and more sophisticated method, entails attaching one color of hair to the bottom of the hook and then stacking and flaring two or more colors on top. Generally used for frog and baitfish patterns, stacking produces a mottled appearance on the back of the fly and a solid color on the belly. I believe that some clipped-hair lures would look better if their entire heads or bodies were mottled. After all, many creatures eaten by fish are not one color; they generally display several colors or at least various shades of one color. To set some of your hair bugs apart from standard patterns, you can use a third method for attaching deer hair that I call blending. The blending method coombines two or more colors of hair to create a mottled appearance on the entire head or body of the fly. The photo at the right demonstrates how blending can change the character of a common banded hair bug. The bug in the bottom of the photo is stir-blended and the bug in the middle of the photo is spin-blelnded. You will be amazed how blending can change the character of any common deer-hair pattern. A standard hair bug with alternating bands of green and yellow deer hair has a dramatically different appearance when the same colors of hair are blended. You can blend various colors of deer hair by using either of two methods, the "spin-blend" technique or the "stir-blend" technique. Each produces substantially different results. The spin-blend technique blends the hair as it spins on the hook, creating a brindled effect with splotches and streaks of contrasting colors. The stir-blend technique, which requires a hair stacker and a stirring rod to blend the hair before it is spun, creates a more subdued, speckled effect. You will find that these methods, particularly the spin-blend technique, produce less predictable results than do conventional methods. The color, the relative amount of each color, the size of the bundles of hair, thread tension, and even the hook size all cause variations. Consequently, no two of your lures will be identical. But that's part of the charm. You won't know exactly what your fly looks like until you've trimmed it, but you will always be pleasantly surprised with the result. Some degree of consistency from fly to fly is possible, of course, but you shouldn't expect to turn out a dozen identical copies of a particular deer-hair lure. The spin-blend technique utilizes a "sandwich" of hair containing two or more colors. The entire bundle of hair should equal the thickness of a lead pencil. As the sandwitch spins and flares on the hook, the colors blend. Here is how to spin-blend hair using just two colors - green and yellow. 1. First, clip a small bunch of yellow hair, about the thickness of a kitchen match, from the hide. Comb out the underhair and shorts. 2. Place the bunch on your vise base or some other raised surface close by. 3. Do the same with an equally thick bunch of green hair, placing it directly on top of the yellow. 4. Cut and place another bunch of yellow hair directly on top of the green. The green hair is now sanwiched between the two bunches of yellow. 5. Carefully pick up the "hair sandwich" and trim both the tips and the butts. 6. Spin and flare the trimmed bundle of hair on the hook shank. Advance the thread as you would when making any spun-hair bug. 7. Repeat the process, packing the hair as you go, until the shank is full. Tie off the thread and your bug is ready for trimming. Using two or more colors, you can create a variety of interesting combinations by alternating the order of the colors during the sandwich-making process. 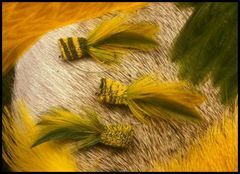 Here ia a finished Spin-Blended hair bug using just two colors of deer hair to make a sandwich of hair - yellow and green. The stir-blend technique is a little more involved, but the effect it produces is worth the effort. You will need a hair stacker and a stirring rod. The rod I use is made from a 5-inch piece of dowel, 1/8 of an inch in diameter, sharpened on both ends with a pencil sharpner. You can also use a metal crochet hook to do the job. The hair stacker that seems to work best has a 1/2-inch opening in the funnel. Here is how to stir-blend hair using the same colors - green and yellow. 1. Clip small bunches of each color of deer hair that, when combined in the stacker, will equal the thickness of common lead pencil. Make sure to thoroughly comb out the underhair and shorts. Trim both the butts and the tips. 2. Add each bunch separately, tapping the stacker as each is added to settle the hair. 3. Once all the hair is settled in the stacker, insert the stirring rod and stir briskly. The more you stir the better the hair will blend. 4. Remove the stirring rod and tap the stacker several time to even the hair. 5. Remove the hair from the stacker, and spin and flare it on the hook shank. 6. Repeat the process, packing each bunch until the shank is full. Tie off and clip the bug to shape. As with the spin-blend technique, you can use more than two colors to achieve a variety of effects. The photo at the left show a bundle of stir-blended hair ready to be spun and flared on the hook. 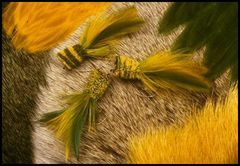 The photo on the right shows a completed hair bug that is composed of just two colors of stir-blended deer hair - green and yellow. The finished bug has a finely speckled appearance. No one color dominates the fly. 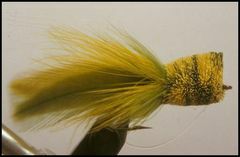 The stir-blend technique can also be very useful for hair-bodied dry flies such as Irresistables and Goddard Caddis, or on the head of a sculpin pattern. Don't get so excited about making mottled bugs that you forget to pay attention to the hair you use. For best results, blend hair with similar, if not identical, characteristics. If you're blending yellow and green, for instance, sort through your patches of hide until you find two--one of each color--bearing hair of the same length and thickness. That way, you'll at least have a rough idea of how the blend will turn out. If you mix thick, coarse, long yellow hair with shorter, thinner green hair, the former will overpower the latter; when you trim the bug, you'll see mostly yellow with a few faint splotches of green. You'll also find it hard to make an evenly dense body if you blend grossly dissimilar hairs. Once you begin blending deer, elk, or any other hair suitable for spinning, let your creative juices flow. I'm sure that you will come up with some great-looking patterns. The fish may not give a rip whether your clipped-hair flies are blended or not, but you will be pleased with the outcome as you experiment with various colors of hair using either technique. And your fly-tying friends will be impressed with your creations. Mine were!